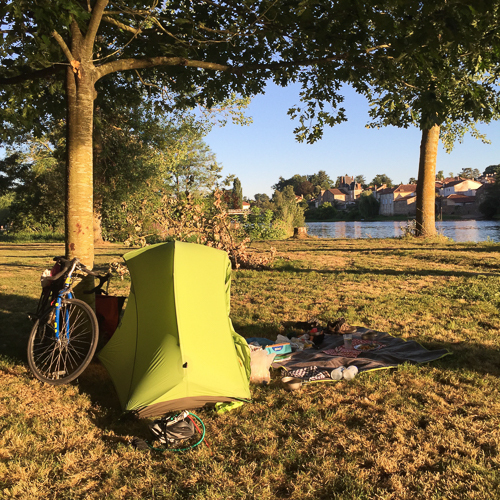 I’ve just returned from a 3.5 week cycling holiday through France and Spain, a journey of just over 1000 miles from Cherbourg to Santander (with a few stops and diversions along the way). I was a little nervous going into it. Would my legs poop out? What if my bike breaks? Are the hills going to wreck me? I didn’t let these questions stop me from going; all would be unravelled throughout the trip. The real question is: how do you even take a cycling holiday in the first place? Get to your starting point. The roads: Both France and Spain are very bicycle friendly and drivers tend to give cyclists a lot of room. The food: You get to fuel yourself in style, sampling regional gourmet delights along the way. 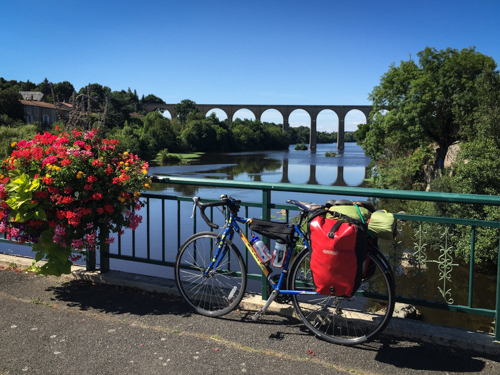 The views: From the Loire to the Lot to the Basque coast, every day will wow you with vistas and valleys that you’d probably miss (or wouldn’t pass at all) if you were in a car. 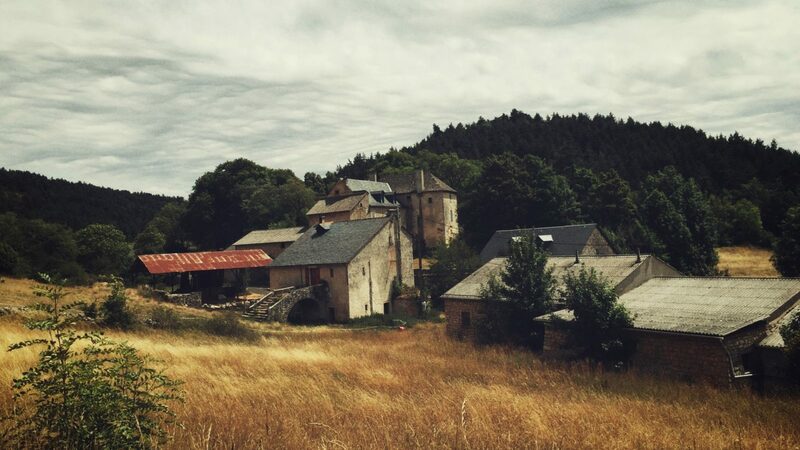 The villages: There are lots of them, many breathtaking in their own right, and offer numerous benefits: history, culture, architecture, picnic lunches, and baguettes. The bike trails: France is loaded with “green cycle ways” (Voies Vertes de France), long-distance bike paths, some paved, offering traffic-free bicycle bliss to those who choose to ride them. Spain also has over 1,800 kilometres of greenways all over the country and is a haven for mountain biking. OK, I realise those three steps above will involve numerous substeps. 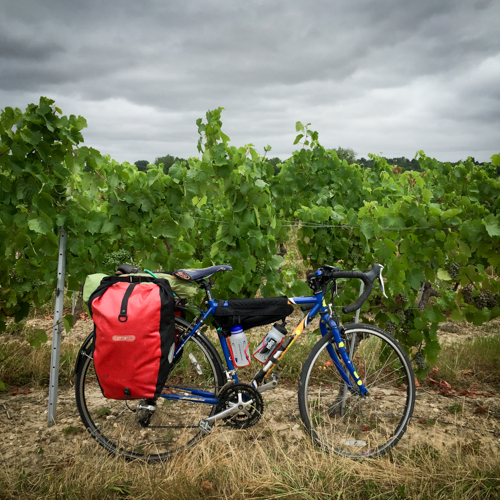 So here are a few more top tips on how to have a cycling holiday in France and Spain. 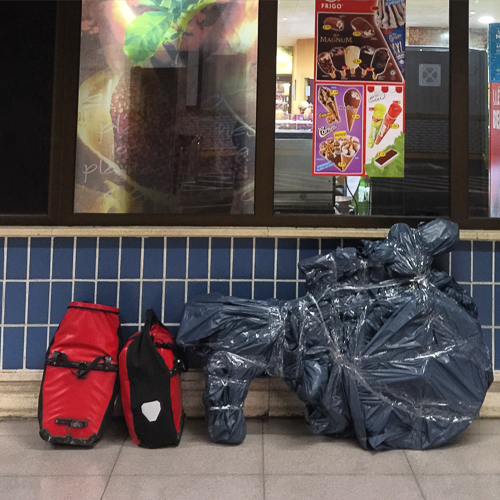 The nice thing about a bike trip is that you want to keep things as light as possible, so you’re forced to keep your packing minimal. If you’ve never done anything like this before, then you might have to invest in some technical bits (panniers, camp stove, etc).  But if you’re an avid camper like me, then chances are you’ve already got a lot of the stuff you need. 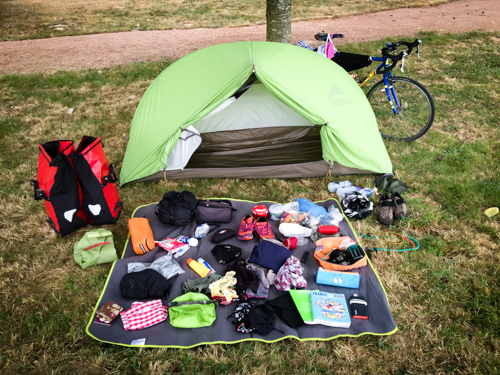 See my Bicycle Touring Packing List for a full gear list. My attitude with most trips is: just get to your destination and everything else will sort itself out. So, too, with a bike trip. For this purpose, I can’t recommend Brittany Ferries enough. Flying would be a pain (you’d have to pack the bike, reassemble the bike, deal with getting out of a busy city, and so on). 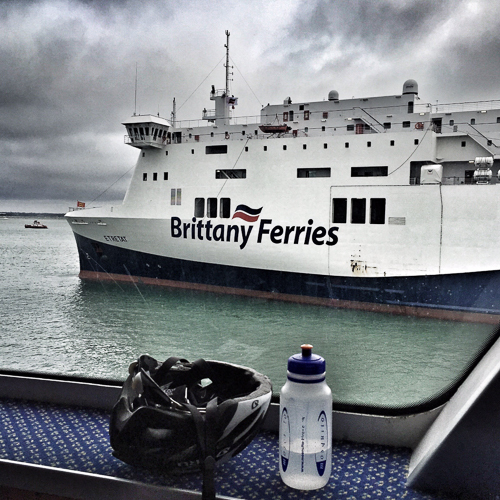 This is not an issue with a ferry as you just walk your bike onto the ship and away you go. Brittany Ferries has ports all along the France and Spain coast, which means you have the option of sailing into one port, and sailing out of another if you don’t want to do a circular trip. I sailed into Cherbourg and back from Santander. Brittany Ferries also has their own Cycling in France and Spain Guide which offers itineraries around the various ports. In fact, I used part of their route to plan the first leg of my trip from Cherbourg down towards Mont St. Michel. A ferry is not only easy, it’s actually really fun. 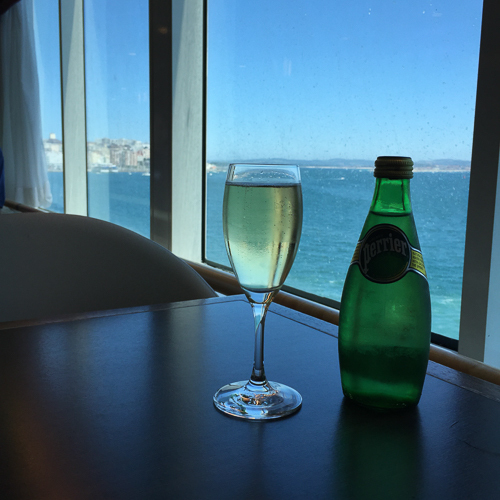 I adore the journey from Santander to Portsmouth, a 24 hour trip during which I can collect my thoughts, write last minute post cards, and have a Vouvre (or three) to celebrate my achievement. 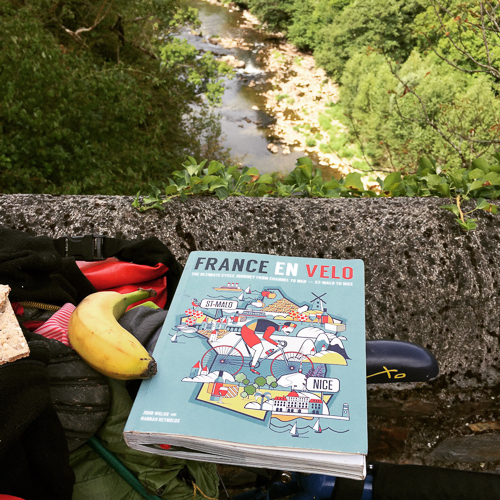 There is a fantastic book called France en Velo that details a 1000 mile bike ride from St. Malo to Nice, including everything along the way including campsites, cash machines, market days and more. It’s incredibly useful, even if you only do part of it, as I did. The only thing I wish is that they made an ebook edition because it’s a slightly hefty tome to haul around with you. In an effort keep things light I relied on my iPhone for maps rather than paper maps. I used a combination of two apps for the job: Google Maps and ViewRanger. I’ve already written about ViewRanger and it is by far my preferred mapping tool. 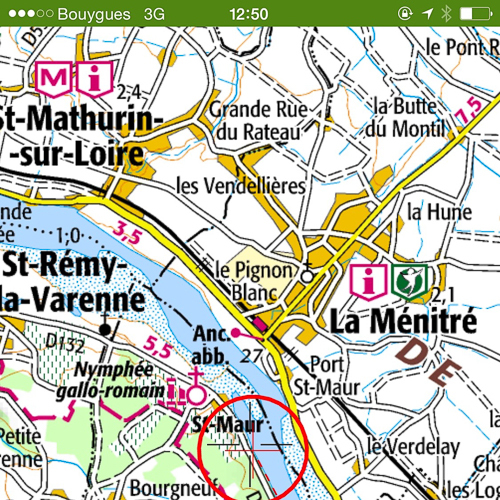 You can download France’s excellent IGN maps directly to your mobile phone and track your location using GPS. The downside: it’s expensive. The app costs £7.99 and then you pay for “credits”; each map you download costs a certain amount of credits. 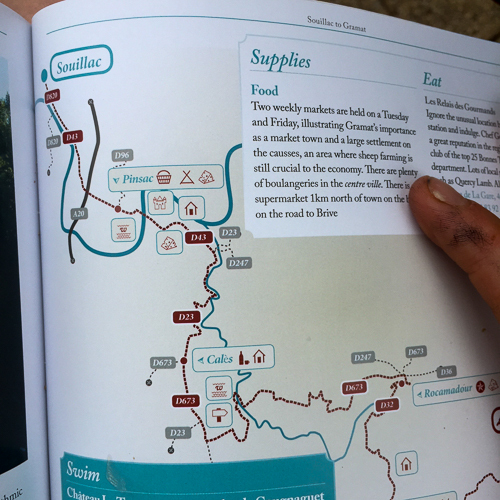 When you’re cycling across France, this can up (if I’d used these maps my whole trip I probably would have spent about £50 or so – a small price to pay for good navigation perhaps, but it still felt it an annoyinglin large sum). Google Maps are free and you can download maps to use offline when you don’t have cellular data coverage. The problem is that they just aren’t as reliable as ViewRanger’s. A minor road might actually be a dirt track (this happened twice). Also, no elevation information, and the scale seems to only show itself when you zoom in or out of a map. Spot Gen 3 – A personal locator beacon that shows people where you are at any given point in time. Really good for safety and peace of mind for your loved ones back home. You have a couple of options here: camping and hotel / b&b accommodation. 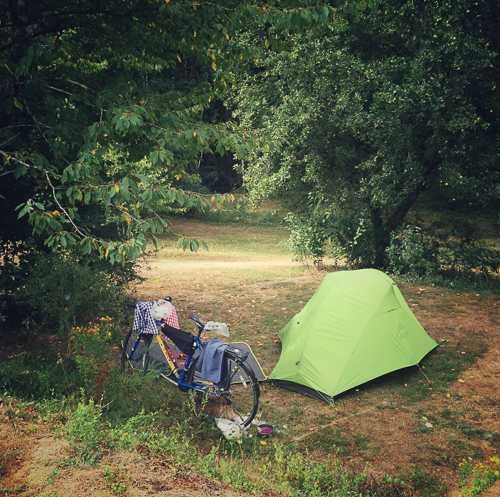 I opted to camp because it’s cheaper and there’s little risk of winding up somewhere and not finding a place to put your tent (I went to one campsite in Spain that was booked solid for cars but said “We always have room for cyclists.”). The B&B route would require a bit more forward planning as you’d probably want to book places ahead. However you’d save considerably on pack weight as you wouldn’t have to carry a tent or sleeping bag. As for camping, France is LOADED with campsites, and they are generally pretty cheap (especially if you go the municipal campsite route). Campsites in Spain are not quite so numerous but you’ll be fine. 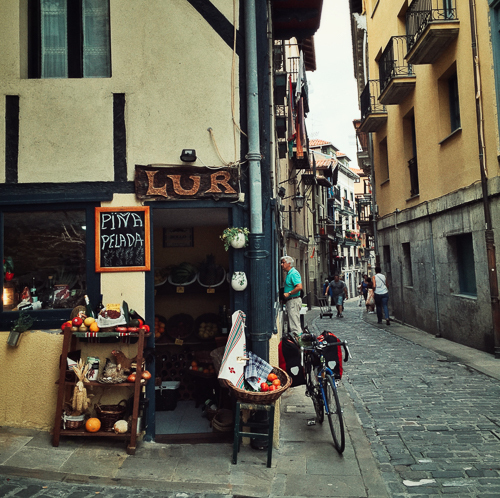 It’s worth popping into a Tourist Information as you go and getting information about campsites along your route so that you can plan accordingly (I got superb help from the guy at the San Sebastian tourist office). It’s not very fun when it’s nearing the end of the day, you’re losing steam, and you have no idea when the next campsite is going to pop up. So always know where the campsites are. In a pinch, you could wild camp, though this isn’t technically legal, and you run into issues like water and your desperate desire to take a shower. This is the most fun question of them all! 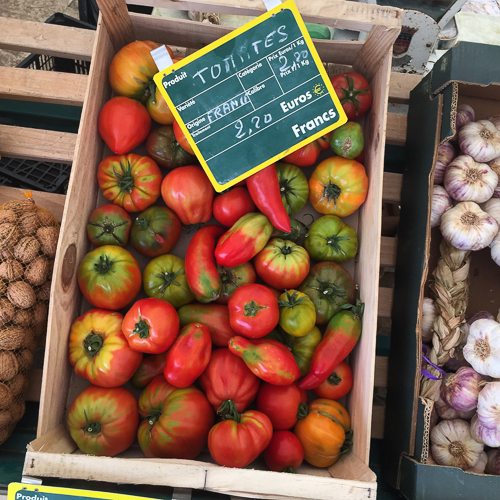 So fun that I’ve written a separate post about it: What to Eat on a Bicycle Tour. Any questions? Any top tips I’ve missed? Feel free to ask away in the comments. I’m happy to provide whatever information I can to get you on your way!